WASHINGTON—In recent days, there have been congressional hearings, government statements, and extensive media coverage about the flood of unaccompanied minors who enter the United States and request asylum. Mothers with children are also crossing the border. The number of unaccompanied children coming has dramatically increased this year in the Rio Grande Valley (RGV) sector. Between Oct. 1, 2012, and mid-June 2013, 13,532 unaccompanied children, up to 17 years old, were apprehended. And from Oct.1, 2013 to mid-June 2014, that number had nearly tripled to 37,621, according to U.S. Customs and Border Patrol (CBP). For the entire Southwest border, the number of unaccompanied alien children (UAC) apprehended so far this fiscal year that ends Sept. 30 is over 51,000, which is more than double all of the entire last year, according to Ronald Vitiello, deputy chief, U.S. Border Patrol. The youth turn themselves in or wait to be picked up by the border patrol. They are not sneaking past the border guards to evade detection. Because they are minors, they can’t be turned away and sent back like adults. 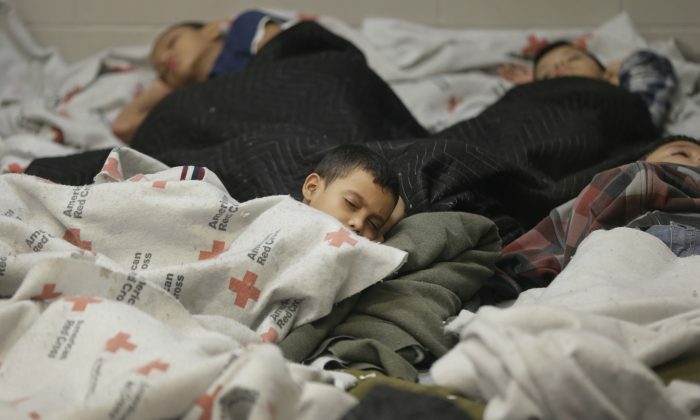 Unaccompanied minors must be processed in accordance with U.S. law. About three-fourths of these unaccompanied children are fleeing three Central American countries—Honduras, El Salvador, and Guatemala. Child migration from these countries has skyrocketed. “This is a humanitarian issue as much as a matter of border security,” said Secretary of Homeland Security Jeh Johnson, to the House Committee on Homeland Security, last week. Johnson has traveled to Texas four times in the six months he has been in office. When he goes on these trips, he talks to children. “We are talking about large numbers of children, without their parents, who have arrived at our border—hungry, thirsty, exhausted, scared, and vulnerable. How we treat the children, in particular, is a reflection of our laws and our values,” he said. The House Judiciary Committee held a hearing last week about the crisis. Opinions differ on the root causes of the problem. Republicans accuse the Obama administration of lax enforcement of the removal of people who enter the United states illegally. Federal policy tempts parents to send their children on the dangerous journey north through Mexico to the Southwest border, paying smugglers $5,000–$8,000. Democrats said the root cause lies in the violence and gang activity in Honduras, El Salvador, and Guatemala. It persuades families to send their children through Mexico to the Texas border. Both sides have hard evidence to support their viewpoints. “While no new law has been enacted, the truth is that this administration has dramatically altered immigration enforcement policies. The timing of the change in policies correlates closely with the steep uptick of individuals showing up at the border. Apparently, word has gotten out that once encountered by Border Patrol agents and processed, thanks to this administration’s lax enforcement policies, one will likely never be removed,” said Goodlatte. The Democratic members on the Judiciary Committee attribute the surge in unaccompanied minors to violence and insecurity in the three Central American counties of Honduras, El Salvador, and Guatemala, where the bulk of these children come from. Several members drew from a U.N. report that ranked Honduras as No. 1 in the world for its murder rate. As John Conyers (D-Mich.) pointed out, it has held that position for four straight years. El Salvador and Guatemala ranked fourth and fifth for murder rates, respectively. Rep. Zoe. Lofgen (D-Calif.) cited a UNHCR report that observed “a spike in violence by transnational criminal organizations” in the three countries. She cited news reports that in El Salvador, a mass grave was found with remains that included children that had been dismembered. Lofgen cited the 2013 State Department country report for Guatemala, which said that hundreds of women and girls are killed each year and most of the victims are sexually assaulted, tortured, and mutilated. He led a delegation in Mexico when they encountered two boys, 15 and 17—”clean-cut and respectful”—who had fled Sam Pedro Sulu, Honduras, which has the highest homicide rate in the world, higher than Kabul, Afghanistan, or Damascus, Syria, Seitz said. Gangs told them that they and their families would be killed if they didn’t cooperate. “The families quickly insisted that they leave and flee to safety,” he said. The story points to painful predicament of parents, who cannot protect their children, he said. Lofgen noted that no significant number of unaccompanied children come from Nicaragua, a Central American country poorer than the other three. Only 168 unaccompanied minors from Nicaragua had been apprehended in this fiscal year, according to CBT. If federal policy caused the surge asked Lofgen, then why only these three countries and not a poor country like Nicaragua? Vitiello, who is responsible for the daily operations of the border patrol, said, “Violence is a contributing factor, but there is some confusion [by the parents of the unaccompanied children] reported by the media [or gangsters] in these locations that there is some benefit to be had in the United States.” He said that’s why Johnson felt it incumbent to write an open letter to parents who are contemplating sending their children to the United States, to clarify U.S. immigration law.